Tu-Th 9:30 a.m. 6:30 p.m.
Fri 9:30 a.m. 6:00 p.m. Ace Of All Surfaces: Ride from home and feel the adrenaline build while chasing tarmac curves towards your favourite offroad location. No trailer required just twist the throttle of the all-new KTM 690 ENDURO R, which really comes into its own when the dirt begins and the trail gets more extreme. Its new chassis, revised styling, and an updated version of the trusted 690 LC4 motor, are enhanced by upgraded electronics and new WP XPLOR suspension. Master more challenging terrain on this lightweight, high-performance king of versatility. 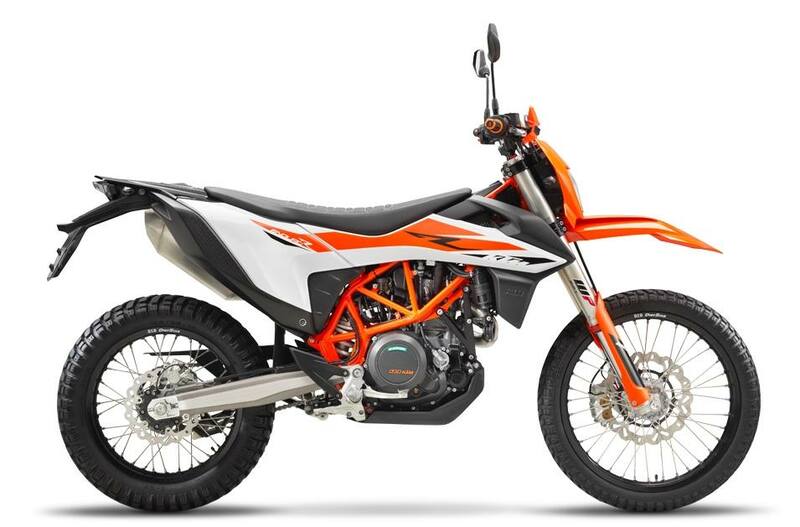 The latest 690 LC4 engine is all about smooth, powerful performance to propel you effortlessly up, down, through, around and over the many types of terrain that you may encounter on this bike. Every aspect of the LC4 engine design is constructed to provide a consistent and confidence-inspiring riding experience. The engine combines powerful acceleration from the very lowest revs with an outstanding free-revving nature and refined engine running. Another big plus: It's extremely economical with fuel.The engine combines powerful acceleration from the very lowest revs with an outstanding free-revving nature and refined engine running. Another big plus: It's extremely economical with fuel. A lightweight, compact cylinder head contains four valves and a single camshaft placed over the intake valves, with a secondary balancer shaft driven by the timing chain. The intake valves are actuated by finger followers and the exhaust valves by a rocker arm. A resonator chamber balances out pulses in the intake tract and makes the throttle response smoother with reduced vibrations.A resonator chamber balances out pulses in the intake tract and makes the throttle response smoother with reduced vibrations. Twin balancer shafts, one in front of the crankshaft and the other in the cylinder head, reduce vibration for a smoother ride.Twin balancer shafts, one in front of the crankshaft and the other in the cylinder head, reduce vibration for a smoother ride. Stainless Steel Exhaust: The exhaust system is made using high-quality stainless steel. It's routed as close as possible to the bike to help with the slim profile, and the exhaust shape has been optimised for hard offroad usage. 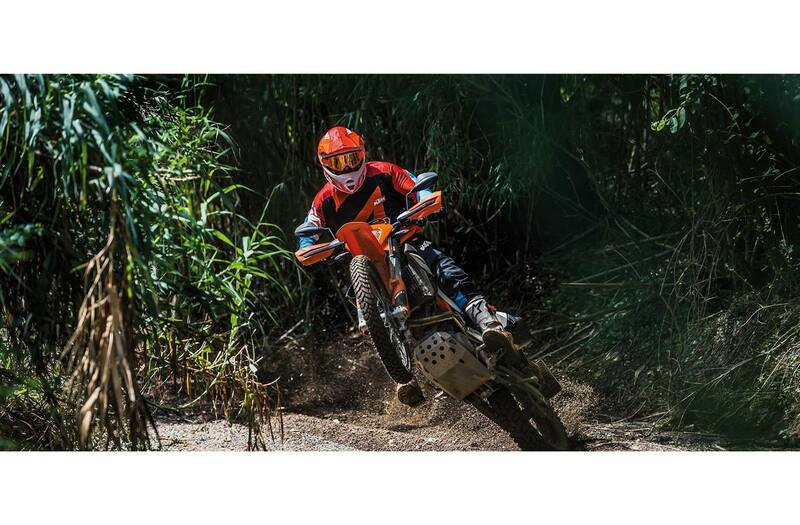 Blasting down remote winding streets, tearing along gravel roads and exploring single-track are all improved on the new 690 ENDURO R thanks to a completely new chassis with WP XPLOR suspension and heavy duty offroad wheels. Master The Ride: The frame is manufactured from lightweight sections of top-quality chrome-molybdenum steel tubing of varying thicknesses. This type of balanced frame design provides high torsional rigidity for best handling and rideability, while a more specifically-tuned longitudinal flexibility can absorb the wheel impact energy, supporting the suspension for reduced rider fatigue. The innovative use of the rear fuel tank as the main structural element of the subrframe, keeps weight low and eliminates design complexity. This swingarm design allows for an optimal mounting position of the rear shock ensuring a high progression rate. The single-component casting process eliminates any inconsistencies and weak points that would be inherent in a welded swingarm. Precise Handling: Highly rigid forged triple clamps with an offset of 24 mm (adjustable to 22 mm), provide a solid grip on the forks for precise handling. They allow forwards and backwards adjustment of the handlebars in four different positions for optimum rider ergonomics. Riding over rough terrain is made easier with the WP XPLOR 48 upside-down fork. The KTM 690 ENDURO R's split fork design was originally developed by WP and KTM for the EXC models. It is fitted with springs on both sides with separate damping functions - compression on the left and rebound on the right-hand side. The cool thing is they have no negative influence on each other. Therefore, damping can easily be adjusted via the dials on top of both fork tubes, with 30 clicks of adjustment each. The WP XPLOR shock absorber is connected to the swingarm by a linkage. This ensures a progressive suspension character and a high resistance to bottoming out. Fully adjustable, including high and low-speed compression, you can set up the shock absorber to any circumstances and rider preference. Built To Last: The KTM wheels use lightweight, CNC-machined hubs and high-end 21" and 18" rims to combine maximum strength with minimum weight. They're fitted with Mitas E07 tyres - a great offroad tyre that offers excellent grip and will last a long time. Class-Leading Brakes: Sublime class-leading BREMBO brakes combined with lightweight wave discs - 300 mm diameter front and 240 mm on the rear wheel - to provide a crucial combination of stopping power and a consitent brake feel. Ample Fuel, Optimum Feel: The large fuel tank has a capacity of 13.5 litres. It is also a load bearing part of the chassis, making it stiffer for optimal feeling and control. The 690 ENDURO R's ergonomics reflect KTM's READY TO RACE design philosophy. It's now much slimmer with a more aggressive feel. The seat height has been lowered without sacrificing ground clearance. This, along with new rubber-mounted lightweight handlebars, enhances overall rider comfort and control. Optimum Control: The lightweight tapered 808 mm wide handlebars are rubber mounted to reduce vibrations. Their width and shape are aimed at providing maximum control in all situations. No Dirt Footpegs: Sophisticated ‘No Dirt' footpegs prevent jamming up of the pegs, even when digging your way through deep ruts or navigating wet terrain. Rubber inserts can be mounted for street use to help reduce any vibration that might be felt through the pegs on smooth roads. Easy Access, Optimal Control: The 690 ENDURO R's seat height is 910 mm for ease of access without sacrificing ground clearance, while the seat material is developed for offroad usage, and is slightly textured to guarantee optimum wet and dry grip. A new era, a fresh look. Heavily influenced by KTM's competition models the 690 ENDURO R radiates a modern aggressive appearance that begs to be ridden hard, non-stop. Modern electronics and software are discreetly incorporated into the 690 ENDURO R, allowing you to better channel the performance to suit the terrain, conditions and your riding mood. KTM's Cornering ABS mode allows riders to always use the full power of their brakes in all conditions, while taking the lean angle of the motorcycle into account. In Offroad ABS mode, the ABS only acts upon the front wheel, while cornering-sensitivity is disabled. In extreme scenarios, the rider can also choose to disable the ABS completely. Two ride modes: ‘Street mode' for sporty throttle response where wheel slip and wheelies are kept to a minimum for optimal street performance. ‘Offroad mode', by contrast, produces smooth throttle response with Offroad Traction Control, which allows wheel slip and front wheel lifting without hindering performance. The modes are easily switched over from the handlebar, making adjustment to the character of the engine possible on the fly. Traction control can be disabled if needed. Lean-angle sensors keeps track of the angle of the bike and send information to the ECU and relevant control units, which use this data to adjust traction control and ABS actuation. Personalise your KTM 690 ENDURO R and take it where few dare to go with the KTM PowerParts range. It boasts a wide variety of accessories and luggage options, each developed specifically for the chosen machine. All KTM PowerParts perfectly complement the rider and their needs, providing that important ‘factory fit' straight from the dealer. Chain: X-Ring 5/8 x 1/4 in.